The following list of questions was posted by Darryl Cotton with his own rhetorical responses, but if the 20 questions are legitimate, people deserve to hear the answers. While I did not write Prop 64 I can reply to the questions posed by Mr. Cotton. Proposition 64 will legalize adult possession, cultivation and sale of small amounts of marijuana and concentrate, retroactively release people from behind bars and clear their records, tax and license commercial marijuana businesses and allow the legislature to make limited modifications after it passes. The following list of questions was posted by Mr. Cotton with rhetorical responses. Nonetheless, while I did not write Prop 64 but I happen to know the real answers to these questions posed by Mr. Cotton. If you are interested in the facts, please read it. In your amended filing of P[roposition] 64, Why did you remove the Local Vote of the people on Bans of Recreational? That was done because it will be easier and less expensive to overturn any future bans through the elected majority of a City Council or Board of Supervisors than it is to write, file, fund, collect signatures, run a campaign, fund and win a voter initiative to reverse an earlier initiative. As things role out, people will come to appreciate that. 2) Why do you believe that corporate monopolies and hyper regulation is a better model than decriminalization? It doesn’t do that. Prop. 64 § 26052 contains strong anti-monopoly laws in Section 6. 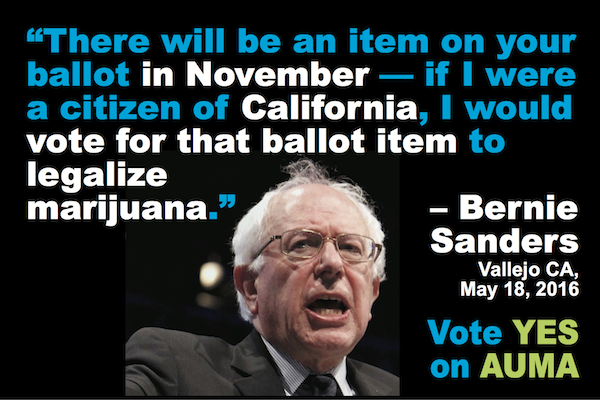 It also gives a hand up to small growers, encourages local seed breeders and regional appellations and offers on site consumption and a microbusiness license modeled on microbreweries and wineries, if we Vote Yes on 64.
Who is currently in State or county Jail for 6 plants or less, one ounce or less, or 4 grams of oil or less, that will be eligible to have sentences reviewed or expunged, as the initiative states ” things that would have been legal if P64 had been in effect…at the time…”? It’s mostly people of color who are behind bars for probation violations or intent to sell charges. 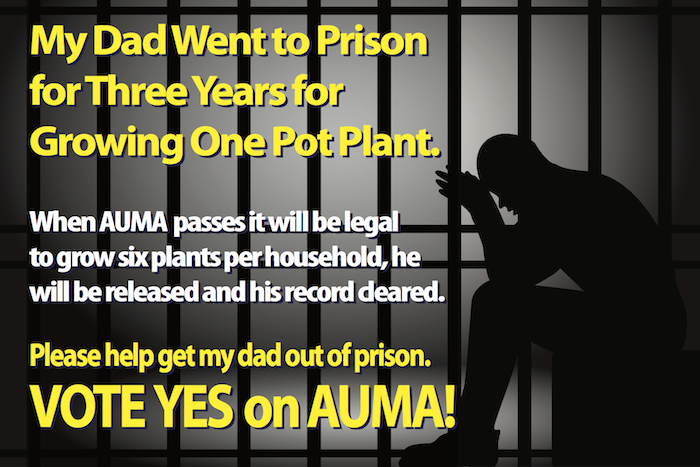 A better question is how many adults are being prosecuted for felony cultivation, sales, transportation or intent to sell, including many growers and collective operators, whose conduct will be either legal or only misdemeanors offenses under AUMA. The answer to that question is that almost 8000 fewer people per year will face marijuana felonies if we vote Yes on 64. Why are you Claiming that taxes will benefit citizens, when clearly the tax revenue ALL goes to crony capitalism, special interests, etc? The initiative says where the taxes go: up to 4% for administrative costs of licensing, then: Up to $50 million / year economic development grants to communities affected by, $10 mil for CA Universities to study, $3 mil to CHP to study impairment testing, $2 mil to Center for Medicinal Cannabis research. The balance is divided as 60% for programs that “shall emphasize accurate education, effective prevention, early intervention, school retention, and timely treatment services for youth, their families and caregivers.” 20% Environmental restoration and preservation, 20% Local law enforcement grants. We believe that could be different, but Prop 64 is good for all California citizens as written. The expenditures are targeted, not general fund money but the legislature could change that in ten years, Prop. 64 allows those adjustments. See response #4. How much of the tax revenue will directly benefit: Schools, Teachers salaries, New School Construction, roads, homeless housing, etc? Since the revised (December 7th) filing of P64 no longer allows the voters to have a say in local recreational, and since this would mean that the current california bans at roughly 75% would continue or get worse, where exactly is the local tax revenue that you say the cities can do what they want to with? Adult possession and use will be a legal right for all adults statewide. Local bans on home gardens will be overturned. Prop 64 does not prevent anyone from filing a voter initiative to overturn local bans. No tax revenues go to law enforcement in localities with commercial bans. Vote yes. Does P64 change the california controlled substances act? It does not do that but it authorizes the legislature to do so. Does P64 Protect Cannabis medical and recreational, from Federal Raids? No state initiative can change federal law. What Prop 64 does is to comply with the federal Cole Memorandum not to interfere with state laws that create a “strictly regulated” and “robustly enforced” legalization law. Does P64 help bring legitimacy to MMRSA, or lock it into place by a voter initiative, thus preventing its overturn as an unconstitutional threat to Prop 215? No. MMRSA cannot change Prop 215 and Prop. 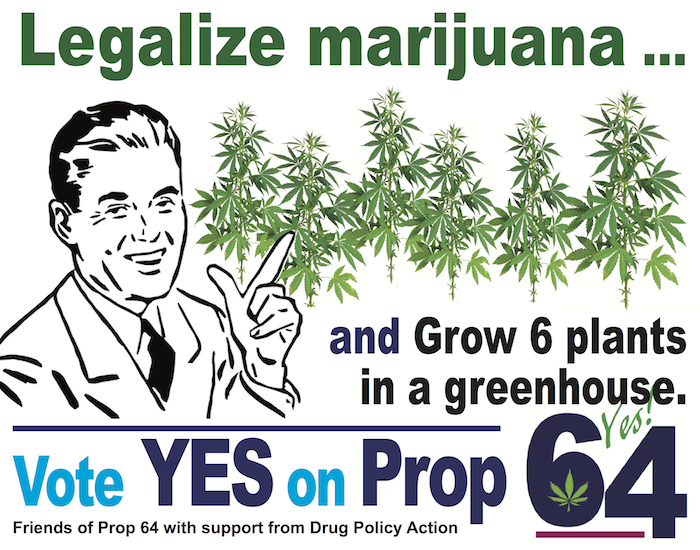 64 protects Prop 215. The legislature can change MMRSA or SB420 anytime they want, they are not even part of Prop 64 — which relates only to nonmedical adult use. Conflicting rights to drive with marijuana, still illegal after P64 passes? You can carry an ounce of marijuana and eight grams of concentrate in the cab of your car in a closed container or in the trunk of your car pursuant to Prop 64’s HS 11362.1. There is no conflict with any other laws; the vehicle code excludes legal activity. If i burn a joint at a concert on friday night…Should i lose my job on monday morning? Why are there ZERO employment protections? Federal drug free workplace rules would have been an issue, polls showed that a ban on drug testing lost us too much support and it could have brought in moneyed opposition, so that battle is left to another day. As long as marijuana is illegal it carries no rights. Once legalized, everything changes. Mandatory $100 Dollar State ID card to avoid 15% tax on Medical Cannabis…So much for the Prop 215 provision that says its voluntary and that a defense in court can be verbal as well as written, so in this regard does P64 destroy that provision of Prop 215? SB 420 created the voluntary state ID card program. Prop 64 caps the price at $100, half off for Medi-Cal and free to indigent patients. People with the state ID card will not pay state sales tax. 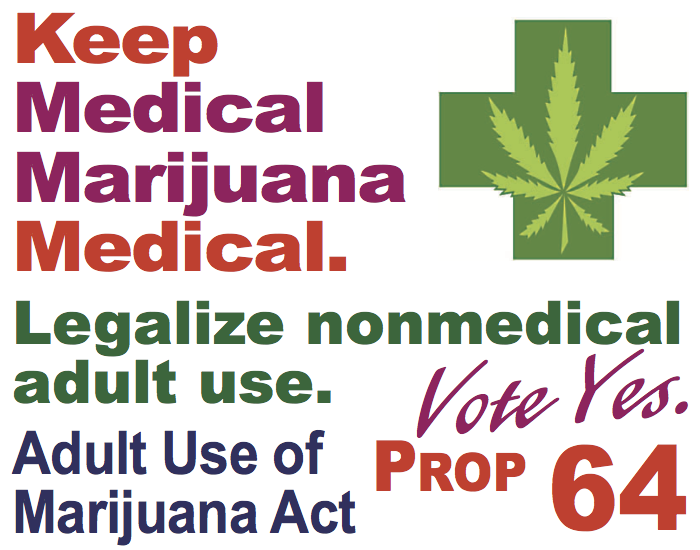 Prop 215 remains in full force and patients gain new privacy and parental / custodial rights if we vote Yes on Prop 64. 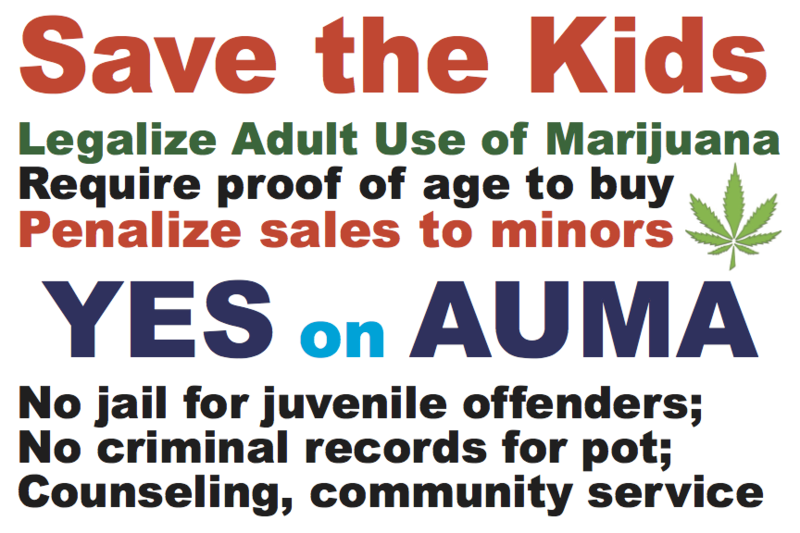 No Real Protections for Recreational users from Child Protective Services, Why? Nobody’s children are protected currently — but patients deserve extra compassion because they have a medical need to use marijuana, whereas nonmedical adults simply make a personal choice. A lack of equal protection for nonmedical adult users is not a valid reason to allow CPS to continue taking away the children of qualified patients. 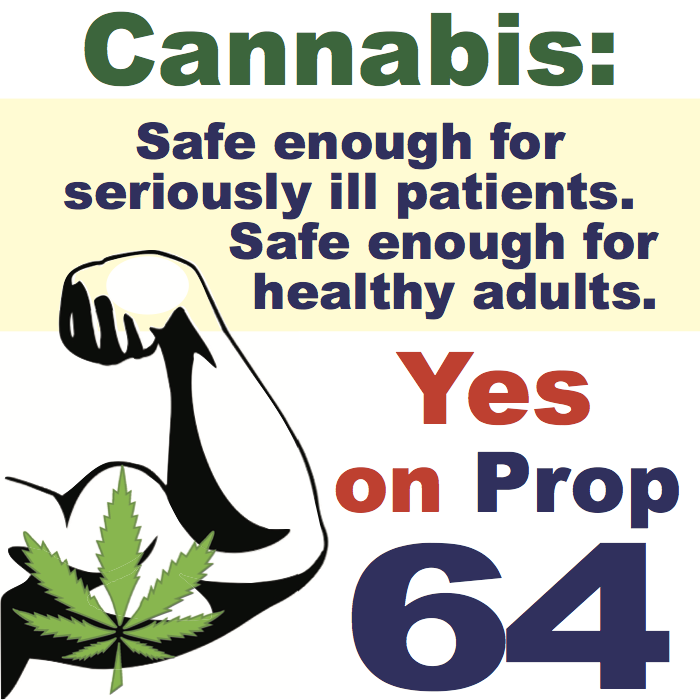 Prop 64 will stop CPS from taking patients’ kids if we vote yes, then we can extend it to all adults. Do you really believe that the Government is going to make this law better over time with their ability to Amend? that they will Open up our access and restore our freedoms? Yes, we do. However, I wouldn’t count on it if the initiative loses. Prop 64 is a good legalization bill that includes restorative justice, consumer protections, promotes small businesses and uses taxes generated to clean the environment, do scientific research and help out a lot of people. 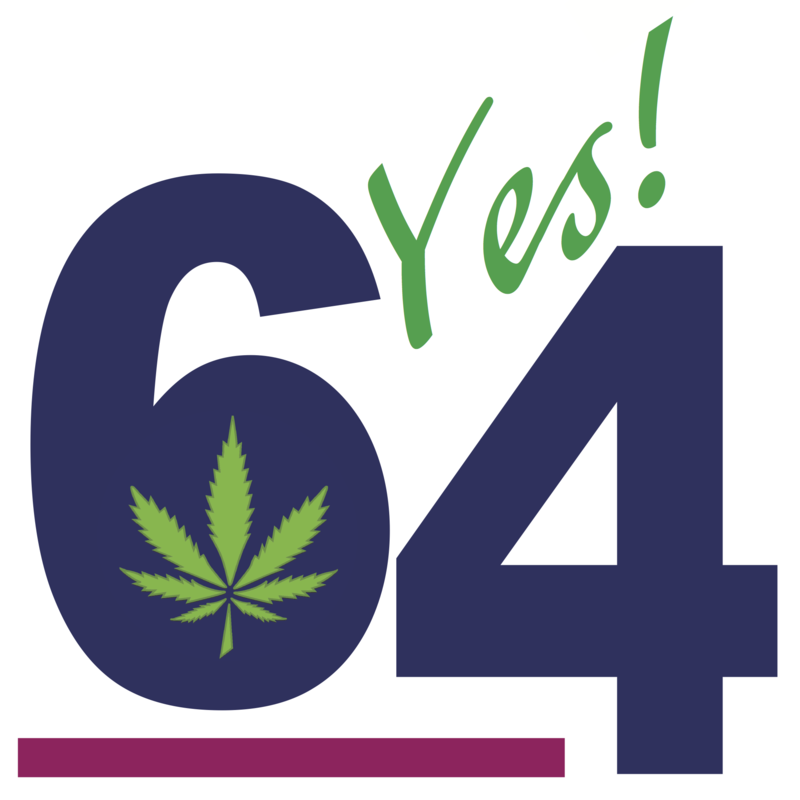 It doesn’t require the legislature to do anything but it encourages them to continue the legalization process … if we vote Yes on 64. Where are the caps or limits on any taxes, local or state? Voters get to set and approve local taxes. That’s in the state constitution it’s not a statutory ballot issue. The initiative sponsors research on how best to draw buyers into the legal rather than the illicit market and we already know that overtaxing cannabis won’t accomplish that. What does P64 do to stop Asset Seizures for businesses and persons? what specific section prohibits asset forfeiture? Prop 64 does that in Section 6, Regulation and Safety, codified as Business and Professions code § 26037. Why does the CHP get up to 50 Million a year forever…was that a Bribe? That’s $3 mil/yr for 10 years. Polls showed that voters two biggest concerns are children and roadway safety and Prop 64 was written to allay those fears. The fund does not target or exempt cannabis consumers from impairment testing. 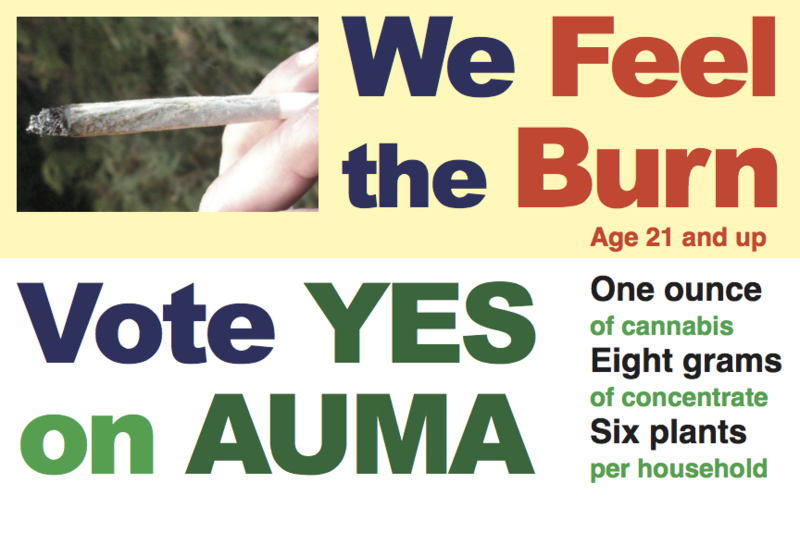 As an added bonus, CHP is not opposing AUMA. Retailers cannot sell at LESS than COST? Why? Retailers will not be allowed to sell marijuana at a loss as a way to put smaller competitors out of business, that’s to keep the big guys from pushing the small growers aside. No price fixing or redlining, either. A compassionate non-profit could provide marijuana at cost, however. A cooperative could provide discounted prices to its members, as another approach. The main constraint on giving away marijuana is the tax collection issue, and it can’t be a business promotion. However, people can give it away and nonprofits could sell cannabis at reduced rates for low income communities if we vote Yes on 64. Why is there no Fee Schedule for Licenses? The Board needs to assess the cost of implementation and start up costs for companies. 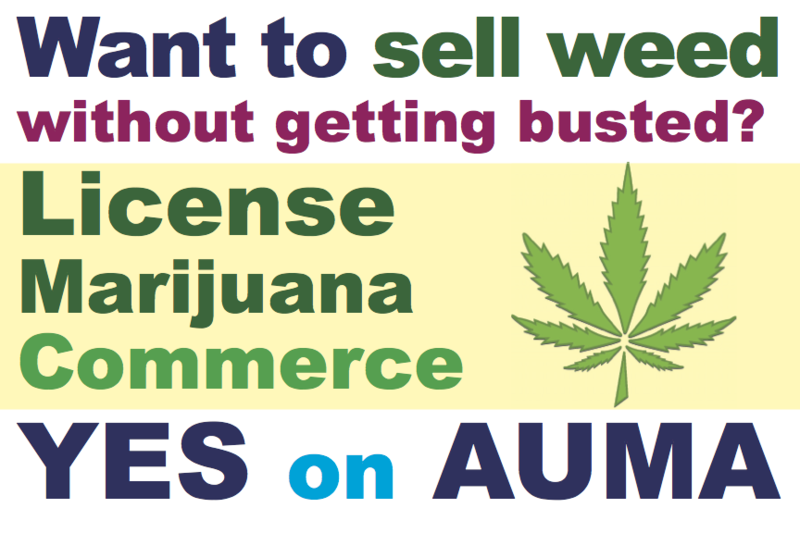 What’s good about AUMA is that its fees are scaled to the size of the cannabusiness, small growers have the option to sell to a distributor, and there are hardship waivers available for almost any obstacle. It just has to be away from kids, environmentally safe and get local approval. Conclusion: While you or I may or may not like any given thing about the Adult Use of Marijuana Act, it represents such a major step forward and its perceived defects are more than matched by our gains. We get four paths forward, depending on your interests: Regulatory agency for licensing and fees, the legislature on further legalization and reductions, the local government for local issues and the courts as a last resort. Prop. 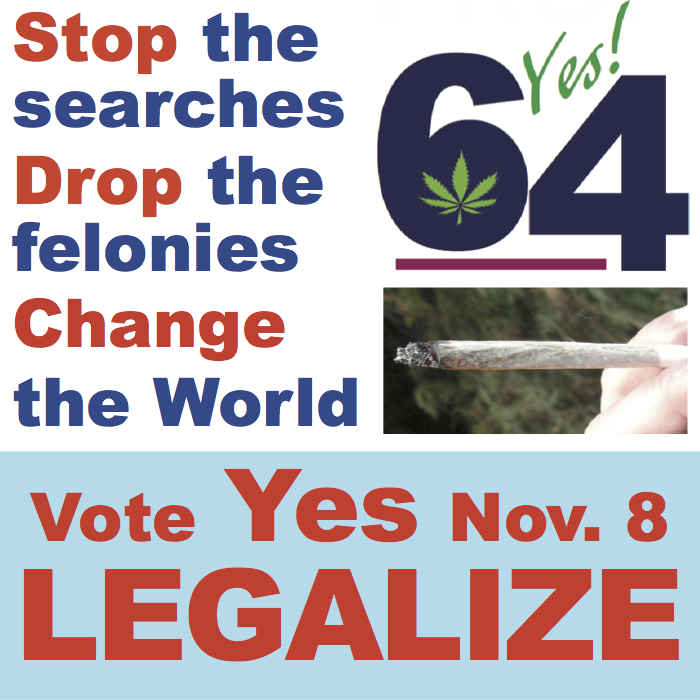 64 was written to change with the needs of the community but the legislature can never make marijuana illegal for adults again, so join me and vote Yes on Prop 64! With the reduction of certain marijuana crimes now reduced. I also feel prop 64 should have looked at and addressed the asset forfeiture that has already taken place. Some folks had their belongings and bank accounts raided by these so called law enforcement agencies.